Alaskan huskies that participate in the grueling Iditarod Trail Sled Dog Race must run 1,100 miles while enduring heavy blizzards, temperatures as low as -40 degrees Fahrenheit and winds up to 60 miles per hour, all of which earn the hearty canines status as the world’s premier ultra-endurance animal athletes. How do they do it? New research suggests the canines are superior to most other mammals, including humans, in at least three key areas: They are unusually adept at adapting to exercise, they have superior aerobic capacity and are unusually efficient in using food as fuel. Michael Davis, a professor at Oklahoma State University’s Center for Veterinary Health Sciences, and his team have been studying Iditarod-racing dogs for 10 years. He added that as the program developed, thanks to the support of mushers, he and his colleagues started studying dogs in other races and even began to conduct simulated races that could employ more scientific controls, such as monitoring the dog’s heart and lung function. “Overall, in the past 10 years, we’ve probably studied well over 5,000 dogs in various studies,” he said. Davis and his team noted that Iditarod dogs, which compete each March by running from Anchorage to Nome, do not usually suffer the adverse effects that are more common in other athletes. These include immune suppression, fatigue, muscle damage and stomach ulcers. Probing deeper into the dog’s physiology, they made three other determinations, which will be outlined in a presentation at this week’s American Physiological Society conference in South Carolina. First, they found that the dogs rapidly adapt to sustained, strenuous exercise. Four days into the Iditarod, the dogs’ biochemical profile returns to where it was before the race began, as though nothing had happened. Elite human athletes, in contrast, show signs of fatigue after continuous exercise and require recovery time. Second, Iditarod dogs possess an enormous aerobic capacity, which refers to the ratio of volume of oxygen to body weight per minute. A fully conditioned sled dog’s aerobic capacity is twice that of an untrained sled dog. Finally, each approximately 55-pound sled dog can burn up to 12,000 kilocalories per day, which is the equivalent of 24 McDonald’s Big Macs. A human would have to consume and efficiently process the equivalent of 72 Big Macs to fuel a day’s Iditarod run. Davis believes the dogs possess very thin cell membranes within their muscle fibers that enable the canines to absorb nutrients from the bloodstream while exercising. 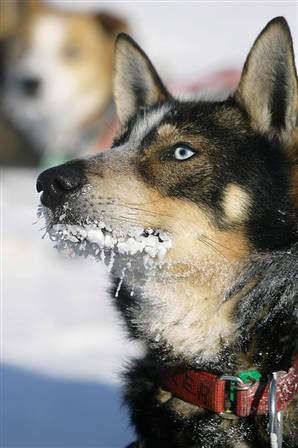 He suspects sled dogs can consume a commercially-produced racing diet, supplemented with everything from salmon to congealed lard balls, and quickly convert it to usable energy. Yet another animal could be nipping at the canines’ top status, however, as man’s most attentive follower. In a separate study, Clive Wynne, an associate professor of psychology at the University of Florida, and his colleagues compared the performance of wolves against stray domestic dogs, to see which would be better at following human signals in a “watch and point to a can” test. With their wild ways, wolves aren’t exactly lining up for the Iditarod, though, which requires training runs that began this month.